Please click the arrow to play Dayenu, a Jewish Holiday song. To Diana, The family’s baleboosteh and Mother, as well as, the one who taught me a tepl is a pot, who smiled when I told her a blintz is a crepe and patiently taught me how to make her special food without a recipe!! May you always be remembered! Passover (Pesach). The major Jewish spring holiday (with agricultural aspects) also known as hag hamatzot (festival of unleavened bread) commemorating the Exodus or deliverance of the Hebrew people from Egypt (see Exodus 12-13). The festival lasts eight days, during which Jews refrain from eating all leavened foods and products. A special ritual meal called the Seder is prepared, and a traditional narrative called the Haggadah, supplemented by hymns and songs, marks the event. 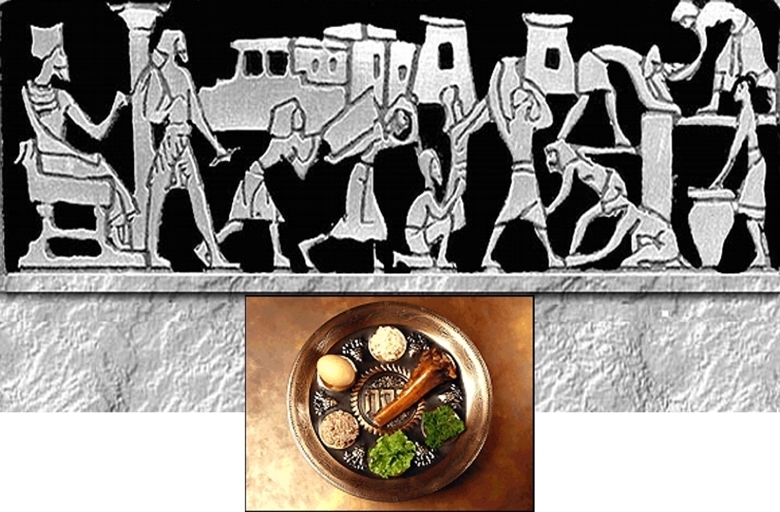 The name “Passover” refers to the fact that G-d “passed over” the houses of the Jews when he was slaying the firstborn of Egypt. Karpas: Vegetable (parsley) symbolizes the lowly origins of the Jewish people; the salt water symbolizes the tears shed as a result of our slavery. Parsley is a good vegetable to use for this purpose, because when you shake off the salt water, it looks like tears. Maggid: The Story of the Exodus from Egypt and the first Passover. Motzi: Blessing over Grain Products at the table. Maror: the blessing recited over Bitter Herbs symbolizing the bitterness of slavery. Korech: The Sandwich of maror and matzah and a little Charoses. Tzafun: The Afikomen a small piece of matzo set aside for desert for children to finnd. Hallel: Praises by reciting psalms. During my early years, up until I was seventeen, I lived on a small farming community in Iowa. My worldview did not extend much beyond the barnyard! Our education in school was fine, as far as, read’n, writ’n and rithmetic–but it lacked greatly as a guide in introducing its students into the ‘varied ways of the world”. My parents, on the other hand always wanted us to be curious about people and gave us freedom to express ourselves. We had the opportunity to find out what was unknown, yet as isolated as we were in the 50’s and 60’s, it was difficult for them to immerse us in a broad spectrum of cultures. What was available, in our little community, was an abundance of Germans, who were strongly immersed in their heritage, but closed to any other. Fortunately, we were lucky to be the only family which did not uphold these beliefs and particularly different because our Mother was Italian. It took Momma years to become a part of the community because of her heritage and because she was Catholic. Early on my sister and I learned what bias and ethnocentrism is because of the towns reaction to my mother and any one else who was not born into the community. At eighteen, I moved to the east coast to further my education. At this point, I knew of only one black person, a small girl who attended our school for two days before her family left upon the request of the town fathers. I remember telling my Mother that when I was talking to her, the school bullies tried to tell me not to talk to her. My mother explained to me what was going on and told me I was correct to speak to her, but others felt unfairly different. The next day I chatted with her again and this time, the bullies were not as kind to the little girl. Their treatment was a warning to me, but I knew in my heart they were wrong. My new school and its location in New Haven, Connecticut provided me with a plethora of ways to expand my worldview. Soon after arriving, I became employed by a Kosher Caterer. Working in many different synagogues, mostly Conservative, contributed to a journey in understanding Judaism that would last a lifetime and provide me with an endless array of wonderful memories. Until October of 1973, my journey remained at a tourist level! I was aware of many holidays and understood the dietary restrictions of Conservative Jews, although my perception of what it is to be Jewish as compared to what the canons of religious belief was negligible. Then on that October night, I met M and all of that would change. Day by day, as they accumulated into the past, I realized I was beginning to understand more and more than I ever thought I would. New doors opened and I became curious about every aspect of Judaism I was shown. Trips to the library and book stores allowed me to get books on the Holocaust, as well as becoming fascinated by the Kabballah, a body of mystical teachings of rabbinical origin, or seeking to understand the difference between a bible and the Torah, a scroll of parchment containing the first five books of the Hebrew Scriptures, used in a synagogue during services. I soon understood what a yarmulke was (a skullcap worn, esp. during prayer and religious study, by Jewish males, esp. those adhering to Orthodox or Conservative tradition) and that treyf meant that a particular food is unfit for Jews to eat or use, according to religious laws. At first it was M. that explained everything to me and then Diana, his mother, who enlightened me to the Yiddish language and told me the tales of her coming to Canada from Poland, where she had been born, and how she used her brother’s passport. She wove realistic pictures of life in a shetl and introduced me to the grand repertoire of her cooking. At times she taught me a single word in Yiddish, like tepl for a pot or surprise me when she made an incredible, yet simple cheesecake, unlike any that I had known. It had a light, airy, cake layer on the top, one running through the middle and one at the bottom of the cake. The cheese filling was far superior to any I had made because the Canadian cheese was unpastuerized making it much more flavorful. Next another obstacle formed when I asked Diana if she had any measuring cups and spoons. I had forgotten mine in the states and I needed them to measure the ingredients for the tiered cake. She smiled and said she would be back…………the minutes passed became an one hour, then two and we began to worry. Just then, Diana opened the door swinging a 1/3 of a cup measure and a tablespoon measure. She had gone through the entire building of residents to see if she could borrow a measuring cup and spoon set! Regardless, we made the cake with the 1/3-cup measure and the measuring spoon!! As the years passed, Diana developed Alzheimer’s and came to live with us. Family visits, including those for Passover, made the next three years happy for Diana. As the first Seder approached, I wanted to make Gefilte Fish just like Diana’s. Hers, unlike so many other recipes, were extremely light, slightly sweet and were made from a blend of pike, carp and whitefish. Diana offered to show me how to make it and once again, we had our lesson. Diana took a pinch and I put the spoon under her hand to measure it until all the ingredients were ready for mixing in the bowl. Before we had measured, we ground and chopped the fish. I was amazed that she was able to remember how to make them. Later that day, Diana, M. and I enjoyed the first of the warm, Gefilte Fish that would be part of our Seder. They melted in our mouths! I tried many new recipes for Seder that year and Diana was able to remember more of her dishes. In the end, the Seder was spectacular and I know she enjoyed having all of her family there. The next two years I prepared the Seders myself. I am a very good cook, but without Diana’s tutelage, the Seders that I prepare could not be as good as they are if she had not shown me how to do so much. In the years following Diana’s death there hasn’t been very many family dinners. Occasionally I will make her wonderful cheesecake, or prepare another of her dishes for M. I do this to please M and to continue to make her recipes so that Diana remains well and happy within our kitchen and in our hearts. Posted on April 14, 2008 June 24, 2012 by suntithenaiPosted in Rememberance, True StoryTagged family, mother, Passover, Rememberance. Next Next post: Please God, Give Me A Break! Frank, I very much enjoyed this story! What a wonderful heritage you have! I’m sure you and M. miss Diana terribly; but what a blessing to have so much of her with you in your hearts and minds. Lynda, I am happy and amazed that you found this blog. I haven’t done much with it since I had to break its parent blog from the Crepusculum account. Then I got very busy and it has been sitting here for a long time. Diana was am extremely smart women who had to fight for all she got in her life. It was sad that she developed Alzheimer’s and even though I cared for her during her last three years before I took her back home, I wish I knew then what I know know of making someone happy and comfortable. I was a lot younger then and working with little experience! Frank, I have no doubt that Diana sensed your good intentions and deep love and respect for her throughout the time that you were her caregiver. Perhaps one of her gifts to you is that you learned much about caregiving from your experiences with her. And this gift is being passed along as you care for your mother. Each lesson we learn in our lives builds upon another that we learned previously, and will become a building block for the next lesson. You are truly a special man, Frank. I look forward to reading more on both of your blogs. And I would be very interested in your First Seder Dinner recipes. You have my email address already. The Roast Brisket and the Carrot Sponge Cake sound especially delicious! I’ve never tried Gefilte Fish. Whenever I’ve seen it in the jars at the grocery store it looks kind of gross! LOL But I would be open to learning to make it myself. I’m sure it’s wonderful if prepared well. I really like what you’ve got right here, really like what you’re saying and the way in which you say it.